Three Steps to the Beach is just that.....walk out the back door and you are literally putting your toes in the white sugar sand beaches of the Emerald Coast. Enjoy the quiet relaxed surroundings with great amenities. The waves will be crashing in the early morning hours.....so make sure you are up to feel the breeze off the gulf and to see the porpoises feeding by the shore. Leave behind your busy schedule for rest and relaxation. This 2 story gulf front townhome offers plenty of room for the family. The 1st floor offers an open Living Room with sleeper sofa, kitchen and dining area and half bath. For convenience there is a full size washer and dryer. Enjoy sitting out and watching the gulf on the 1st floor patio with seating. The 2nd floor offers a King master with private patio and bathroom with double vanity sink and shower/tub combo. Across the hall is the guest bedroom with a double size bed and 2 twins and private bath with shower/tub combo. The condo offers WIFI access. Located in the secluded area of Inlet Beach, Three Steps to the Beach is a great location to relax and unwind but is still within a short drive to great shopping and dining. Located within a mile of Rosemary Beach and 20 minute drive to Pier Park. Paradise30a-When you book your vacation in Florida's Panhandle, with Paradise Properties Vacation Rentals and Sales , you can expect first class customer service from the moment you inquire. All of our properties are professionally cleaned, inspected, and maintained at the highest level. We are located close to all of our properties and we are available 24 hours per day and 7 days per week to ensure your vacation is flawless. Our goal is to build a lasting memory for all of our guest. Can't get any closer to the ocean, amazing! 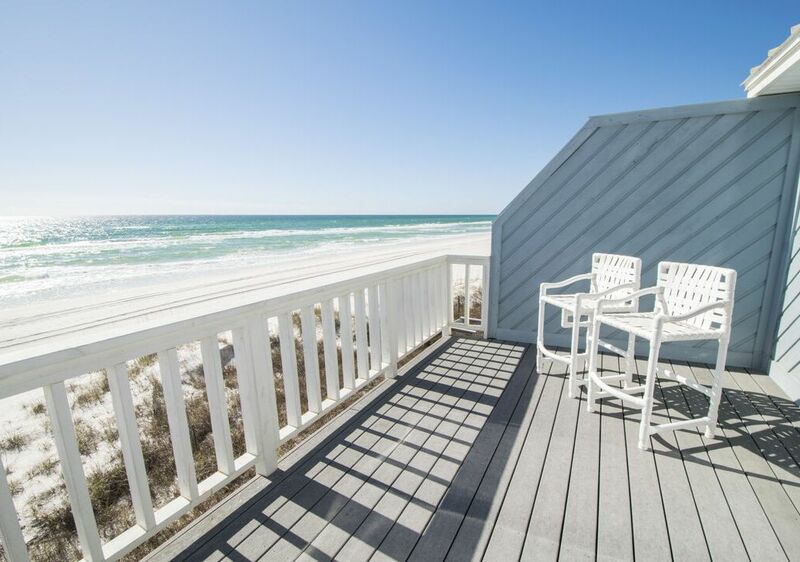 Three Steps offers amazing views, best beach location along 30A, and a well equipped home with everything you need to make a first class vacation! We rented bikes and rode to Rosemary and Alys Beach for lunch and dinners. Had wonderful meals at The Terrace Restaurant, George's, La Crema, Cafe Thirty A and the Donut Hole. The weather and beach were perfect. We will continue returning to Three Steps for our beach trips! Perfect location - can't wait to go back!! We loved staying RIGHT on the beach - and can't imagine a future vacation without beachfront now that we've experienced it! The property was well-furnished. We loved the decor/layout and enjoyed cooking all of our meals in the great kitchen. Food allergies keep us from dining out but we had the best seat at the beach each night on the patio's picnic table with front row view of the waves. Tropical Storm Alberto couldn't even mess up the week - we enjoyed watching the big waves from the safety and comfort of the sofa! The management company called to check on us after the storm and again at the end of our stay. The coffee maker carafe had a crack which we discovered the first morning. I submitted a repair request on the management company's app and a new coffee maker was delivered within an hour! Destin Ice Market 30A was super convenient for to-go fresh steamed shrimp, crab dip, etc. Publix also nearby. We enjoyed biking to Rosemary, Alys (& the nature trail) - on the rainy days we explored Panama City and Destin - Three Steps is between the two. We are already looking for dates for our next stay in Three Steps! Thank you so much for your review. We are pleased to hear that you had a great stay at Three Steps to the Beach and look forward to booking your next vacation! Oceanfront Paradise - Spectacular Views!! Three Steps is just steps away from the magnificent waters of the Gulf of Mexico. The decor offers a tasteful and classic feel making it the perfect beach home. Nearby Rosemary, Seacrest, and Alys Beaches offer an array of casual and fine dining, all just a short walk or bike ride away. This is the only place to stay if you want to be right on the beach. Can't wait to return to Three Steps! Thank you for sharing your experience at Three Steps to the Beach. We can't wait to see you again next year! Beautifully decorated and comfortable. Proximity to the beach can’t be beat! We enjoyed our stay at “three steps to the beach” the townhome was very clean, beautiful and comfortable. We’ve stayed at many places along 30a over the last 8 years and this was by far the easiest walk to the beach-no steep, long stair cases over the dunes. We were able to sit on the deck while our 3 kids played in the sand. Inlet beach was definitely less crowded than 30a beaches and a lot less traffic driving around. The decor in the townhome is minimal, beautiful and beachy. The ice maker and washing machine were not working, but were both repaired within hours of me letting them know. Great service! Thank for your your review. You can't beat the location and convenience of Three Steps to the Beach. We apologize that you experienced issues with the ice maker and washing machine, but glad that we could get you up and running shortly after informing our team. We hope you had a great experience and hope to see you again in the future! This townhouse is AWESOME! You just can't beat staying right on the beach and being able to look out the windows to see such beautiful water and hear the waves when you open the sliding glass doors. This beach tends to be less crowded than the others nearby. You're close to a lot of great restaurants. Very relaxing and we had a great time. Thank you for the review. We are happy to hear that you had a great vacation and hope to see you next year! Perfect property right on the beach! The property is extremely well maintained, newly renovated, and spacious. Great getaway for families, couples, or singles. Ideally located to PCB and 30A but without the traffic. Hidden gem! Thanks for your feedback. We are happy that you enjoyed your stay and hope to see you again soon! Plus $175 clean fee, 11% tax, $75 processing fee and damage protection.